I am definitely a regular Robinson's Mall (Galleria branch) regular customer and their SALE is what I'm always been waiting for. 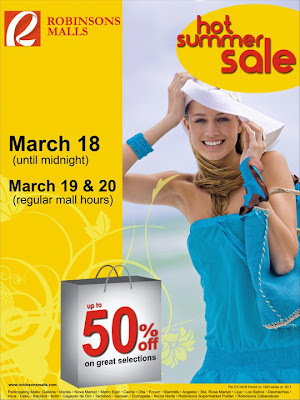 Come this March 18- 20, 2011 (Friday-Sunday), they will be Robinson's Malls 3-Day Hot Summer Sale that we all shoppers don't want to miss. It's a mall sale so every stores inside Robinson's will be giving discount from 50% off or more.